Lucille abducts George Michael for a mother-son dance and intends to sabotage. On the other side, Buster adjusts to now having a hook for a hand; G.O.B. reunites with his estranged wife, and Tobias stars as George Sr. in a biopic about the Bluth family. Due to his supreme acting skills, Lindsay becomes more attracted to Tobias. 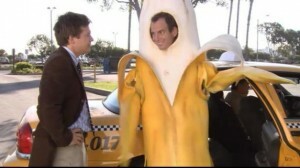 Becoming fed up with unintentional roast he experienced at the Bluth Company Christmas Party starting when he fell from a crane in a banana suit, G.O.B. has mass firings Plus, Michael is forced to rebuild the Banana Stand, and Buster attempts to take an absence from the Army at an arcade game. Michael spends quality time with Buster, when Lucille gets annoyed with him and makes Michael take him to work for the day. George Michael auditions for a school play to get closer to Maeby and hopefully get a kiss. Being a horrible director, Tobias completely ruins his chances. G.O.B. breaks up with his girlfriend, but then he has nowhere to go. George Sr. plans an escape with balloons while the family’s new attorney is working on their defense case and Lindsay has a plan to charm him. Being embarrassed of his family, Michael attempts to destroy all evidence of them so he can keep Rita away from them, and this goes terribly wrong. Buster is trying to gain self-confidence and Tobias is there to lend a hand. G.O.B. tests out his new “forget-me-now” pills. George Michael gains a huge responsibility when Michael puts him in charge of the Bluth Frozen Banana Stand. Unfortunately, he ends up burning the stand down, which leads to several flashbacks that explain how this event happened. Tobias auditions for a commercial, and Lindsay inadvertently gets the part, and G.O.B. deals with feeling unneeded. In what viewers thought was the series finale, Michael is thankful that all of the charges against his father are dropped. 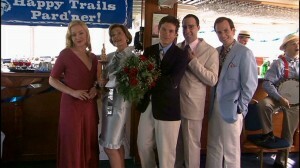 Lucille then throws a yacht party to celebrate the family’s recent success, but the Bluth’s learn the sailing is still far from smooth as the SEC soon learn of their party. Maeby is trying to get the family to sign away their TV rights to her story, viewers learn who holds the real power in the family. Ice, a bounty hunter, is hired by Lucille to find George Sr. He discovers that he has been executed in Mexico, and the family holds a wake. Maeby attempts to set up Lindsay with Ice. During the wake, G.O.B. attempts an illusion in which he is buried in place of his father’s body. Meanwhile, Buster was told he was attending a birthday party. George Michael discovers George Sr. alive in an underground bunker and hides him in the attic. 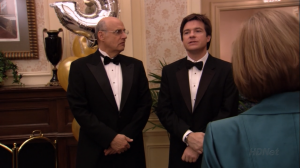 George Sr. passes over Michael for the head of the Bluth Family Company after years of Michael dealing with his family just so he can get it. The position is given to his mother, Lucille, and in response Michael heads to Arizona for a new job. George Sr. is jailed by the SEC, and when his family demonstrates they are unable to run the company, Michael begrudgingly returns to help. Meanwhile, G.O.B.’s magic career is hits a bump in the road and George Michael realizes he has a major crush on his cousin Maeby. 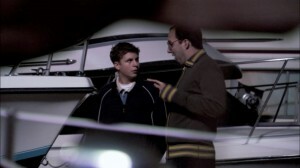 Michael is suspicious that George Michael is using Marijuana; however, Buster needed him to get it from G.O.B. when he learns that medical marijuana will help cure Lucille’s vertigo. Lindsay forces Maeby to spend a day with Lucille to punish her for bad grades, but Lindsay ends up resenting their connection. In an attempt to raise money, the Bluths decide to throw a fundraiser called “Save Our Bluths.” This results in Lindsay taking care of the house, Lucille trying to win over benefactors at the country club and G.O.B. accidentally working as a waiter at the club. Michael is concerned that George Michael has OCD and enrolls him in the school, Openings, where Andy Richter’s brother Donnie Richter teaches him. We learn that George Michael doesn’t have OCD, but actually is just trying to make sure Lindsay doesn’t destroy their home while trying to care for it. Maeby continues to double as a movie producer and gets Tobias a small role as an extra. 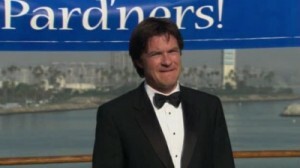 The Bluth fundraiser naturally ends in a disaster, but the family raises the necessary money anyways because Michael’s speech didn’t sound pathetic.